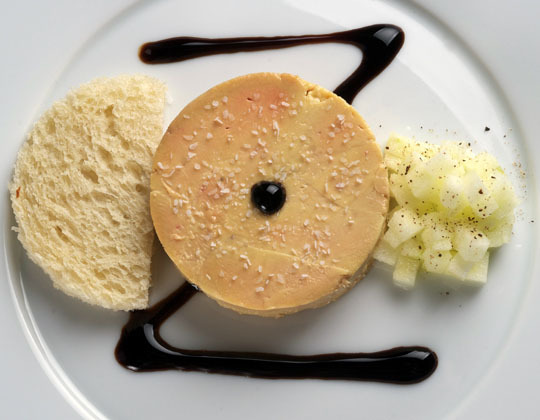 Great foie gras fun going on in this household ever since del Grosso asked me to write about the foie gras au torchon he and Pardus’s created for Hudson Valley Foie Gras. It’s an excellent product. And it was fun showing people that serving foie gras doesn’t require a Catholic-length production, but can be simple and casual. Sometimes, though, you do want to elevate it, make it yourself and serve it to people you care about. So herewith, a step-by-step slideshow of the foie gras au torchon, one of the greatest culinary preparations known to man. I first learned about the torchon—which means dish towel in French, because the foie is traditionally wrapped in a dish towel (love that this culinary luxury is wrapped in a lowly towel)—while working on The French Laundry Cookbook. I wanted to try both the traditional version and a sous vide version, so I asked Hudson Valley Foie Gras for two foies, which they generously provided (thanks Marcus!). The traditional method in the slideshow wins by a mile! I will never sous vide a foie gras again. Too much fat is lost. The below ratio was suggested by Bob del Grosso and modified by me during the testing. It’s a great all-purpose ratio. My foies weighed just under 800 grams each or 1.75 pounds. I’ll also give the French Laundry recipe for those who want to use American volume measures. It’s a very light seasoning—you can do it by eye the second time around. The basic overview of making a foie gras au torchon is this: devein, season, roll in cloth, poach, reroll again to make sure it’s tight, chill, slice. That’s it. Anyone can do it. The steps take place over a few days, but none are hard, and it’s all fun! To see the photos with captions, view them on my photostream at flickr. Day 1: Pull apart the lobes and remove as many veins from the foie gras as possible. Remove any sinew or membranes from the outside of the foie. If there are any bruised parts, cut them away and discard. Working from the bottom of the lobes, butterfly them and locate the primary vein in the center of each. Slice through the lobe to the vein, following its path and pulling the foie apart to see the vein clearly. (Don’t worry if you mangle the foie, better to get the veins out). Put the foie gras in a baking dish and cover with milk. Press plastic wrap down onto the surface of the liquid. Refrigerate overnight or for up to two days. Day 2: Drain and rinse the foie gras. Combine the salt, pepper, sugar, and pink salt (if using). Sprinkle the seasoning all over the foie gras. Press the foie into a container in an even layer 3/4 inch to 1 inch thick. Sprinkle it with the Cognac or Sauternes if using. Press a piece of plastic directly against the foie gras so as little air as possible is in contact with it. Refrigerate overnight. Day 3: Forming, cooking, and hanging the torchon. Remove the foie from the container and let it rest for an hour or so at room temperature (it will be easier to work with). Place it on a piece of parchment paper (best) or plastic wrap (will suffice) in the form a loaf about 6 inches long and 3 inches wide (16 x 8 centimeters). Roll the foie into a log, twisting and squeezing the ends of the parchment paper or plastic to help compact the foie. Unwrap the foie, discard the paper or plastic and transfer the log to a piece of cheesecloth about 1 foot wide by 2 feet long (30 x 60 centimeters). Place the foie on the short end of the cheesecloth. Begin to roll it to force the foie into a compact log again. Using butchers twine, loop a length of string around your index finger. With the same hand, hold one end of the cheesecloth tightly and wind the string around the end of the foie. Continue wrapping the string about 1/4 inch into the foie gras, this will help force the foie gras to compress into a tight roll and tie it off. Repeat the procedure on the other end. Tie a few ties along it’s girth for extra support. In a wide pot, bring enough stock or water in which to submerge the foie gras to a simmer. Prepare an ice bath. Place the torchon into gently simmering liquid for 90 seconds. Immediately remove the torchon to the ice bath to cool, 5 or 10 minutes. The foie will be loose in the cloth. Make it compact again by compressing it in a second cloth (leaving the first one on). Roll it as tightly as possible. Twist and tie the ends of the towel with a string and hang the torchon from a shelf in the refrigerator overnight. Day 4: Unwrap, slice and serve or slice, cut with a ring mold and serve. Marinate the foie gras in milk for a day, refrigerated. Follow the above technique for deveining, seasoning, wrapping, poaching and so on. The French Laundry soaks in milk before deveining; I think it’s more effective to disrupt the vessels first, then soak—takes out more blood. French Laundry uses white pepper, I believe for cosmetic reasons. To me white pepper has an unpleasant chemical taste so I never use it; I don’t mind the black specks. You can purchase whole foie gras from Hudson Valley Foie Gras, linked to above. If this is your first time, you may think 90 seconds in hot water isn’t nearly enough time to cook anything so fat. In fact, you aren’t really cooking this, you’re more or less melting it all back together again. Foie gras is mainly fat so, unlike the moist protein environment of meat, it’s not very hospitable to bacteria. Plus it’s soaked and cured for a day. You could probably eat one raw, veins and all, straight out of the bag without worry. Remember that foie is maleable. It’s composed mainly of fat. If you wanted, you could poach it, then pack it into a terrine mold, and weight it down to compress it, then chill it. That would work great too. In Return to Cooking Ripert does this, only he layers in some mango which is an awesome pairing with foie gras. Finally, if you were in a hurry, you could do the steps in Day 1, 2, and 3 in one day and have a finished torchon tomorrow. Foie gras and mushroom galette is a fabulous dish from Chef Pascal Barbot of L’Astrance in Paris, France. I’m a bit surprised that the sous vide technique lost out due to texture issues. Wasn’t sous vide originally developed as a way to minimize fat loss when preparing foie gras? The torchon looks lovely. Great photos by Donna (as usual). How long does it last? Can it be frozen? I have always wanted to try this preparation, but for 2 people, it might take a while to go through almost 2 lbs of foie. Yes, freezes great! portion and wrap well and freeze. At momofuku ko they actually serve it frozen! They take a cured, frozen torchon and grate it with a microplane. It makes a blizzard of foie gras “snow” on the dish. Fantastic! That sounds great, I will be making one very soon. Now I can have it my way at home. Too many restaurants think people won’t like foie if it’s not drenched in some candied sauce or overly fruited thing. It’s simply great with some crunchy salt on it and some sauternes to sip, but to drench it in gummy super sweet fruity sauce is just ruining it. Heck, all I really need is a spoon. the photo tutorial is fantastic and you really do make it look so simple..if only we can find a lobe of foie to play with! Does it matter if the foie gras pieces are left in significantly different sizes from the deveining process when soaking in the milk or should they be more or less uniform? It’s better to have them uniform, but not fatal if they are not. Also, try to put the membrane side of the pieces on the outside of the torchon and make all of the piece-to-piece contact surfaces from the inside of the liver. I have clear memories if removing those veins and rolling the torchon. I love the taste so it was really worth it. I like it with rhubarb chutney and I think I also mentioned once, pickled mustard seeds. like the rhubarb chutney idea! So odd that the SV foie gras lost more fat and ended up grainy. Why would that be the case?? Does the Foie need to be surrounded by a liquid maybe? What if it is bagged along with a cup or more of water and then cooked SV? I am even more puzzled by your result with SV Michael after re-reading (pasted below) Bob’s earlier post about this right here on your blog! Is your SV rig out of whack maybe? bob wrote me about this. he can get away with it because he is able to vacuum seal. i could not. basically, it seems like the foie breaks and doesnt come back together again when cooled and shaped. Ruhlman–what do you say about passing foie through a tamis? Is that only for terrines, or is it ever appropriate for torchons? What kind of impact would it have on the texture and appearance of a torchon? 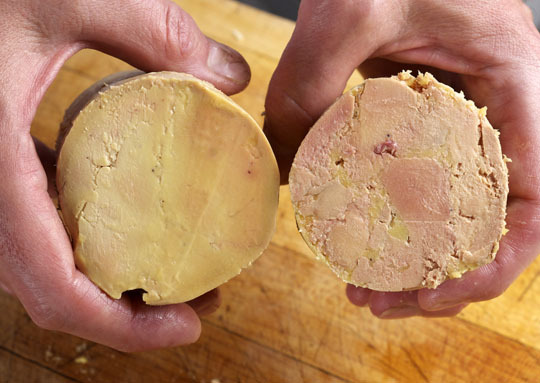 this is great to do with torchon, turns it into a smooth pate that can be piped into a terrine mold and scooped out with a knife. Do you happen to know the weight of the serving size in the beautiful photo of the plated torchon? I’m trying to estimate how many people I can serve with one order foie gras from Husdon Valley. Thanks for the recipe and demo! I have saute it and made a terrine, but never the Torchon! Must for the Holidays! Now that I’ve had a chance to read the post on a computer (I only have a Droid to read on at the farm) I have to say that it’s a damn nice post. Extremely thorough and informative. I still think you are overstating the down side of sous vide. One could argue that the poor results you got were in part a function of the fact that you didn’t vacuum which is, after all, a fundamental part of the process. When Mike and I worked on this, we vacuumed, got no fat deposits and lost between 6 and 13 % of the green (raw) weight during cooking. I even made a few where I took the fat and used it like couverture on the torchon and dropped the fat loss to less than 5%. I’m sorry I did not warn you when you wrote that you were using a zip lock. It’s just did not cross my mind to say anything. So, don’t give up on sous vide it’s a great technique. It looks like Zorro’s torchon. Plating was very rushed and last minute! MR -” he can get away with it because he is able to vacuum seal. i could not. “…….I used a “Food-Saver” that I got online ( 2 machines for $99 incl shipping, so I wouldn’t have to schlep one back and forth to the ‘Nut house every weekend) It did the job. Del Grosso has to do sous vide for production reasons. A home cook doesn’t. I would put my traditional up against your sous vide one any day. In fact, as that would require our getting together, we should do this! To put a finer spin on this. Imagine having to poach 200 pounds of foie gras au torchon in cloth a week, while satisfying all of the USDA requirements. The torchon looks great. Still, I think my favorite way to eat foie is seared, on really good grilled French bread with a small dab of slightly sweetened wild blackberry preserves on most bites. Really good REAL balsamic vinegar is nice, too, but not quite as tasty as the blackberry preserves. I would think wrapping the torchon with cloth exactly as Michael did and then using a FoodSaver to bag it like Pardus said should work perfectly fine. You are right: wrapping it in a cloth and vacuuming it does work well. I’ve done it several times with good results. M-I love that a traditionally prepared foie gras is moving into the everyday realm- ok, maybe not every day, but demystifying technique is an important part of sharing the love. Next, we’ll start talking about duck gavage! Especially grateful you corrected the term. I’ve fixed in the post. I should run this stuff past you before I publish! However, I decided to get over it and go with the flow for one very obvious reason. When everyone around you is calling it “Torchon” you quickly start sounding pedantic if you insist on correcting each person who misstates the name. And then there is the question of whether or not we want the dish to become more broadly accepted by the American public. I can think of dozens of foods that would never have become widely accepted if the producers insisted that the proper names be used. To an Italian “Balsamic Vinegar” is “Aceto Balsamico” and “prosciutto” (as in air dried ham) is usually “Prosciutto di Parma” or “Prosciutto Daniele” and so on. I still get a little crazy when I hear people say “mut-za-rell” and not “motz-a-rell-a” but that’s my problem, not theirs. So, apart from not wanting to offend a francophone or francophile when we describe the finished product by the cloth within which it was cooked (Not an uncommon thing in any language. For example “petite marmite” is a broth and the vessel in which the broth is served.) I see no reason not to call it a torchon. That said, I agree with your decision to use the correct name in the title of the post. I curious to know what is benefit of foie gras for our health ? Can somebody tell me ? If France it’s recognized as a premiere diet food. It makes you happy, which in turns boost your immune system and prevent depression 🙂 A side effect is that enjoying great and subtle food like foie gras prevents you from enjoying something else, like a Big Mac or any other type of junk food, which in turns is very healthy. I used to make mine this way but when I was running a casual cafe and wanted to serve foie on the cheap I figured out a different technique. Buy the foie gras end pieces & tid bits which are only 20 bucks a pound and place em all in a zip lock bag and drop into water bath for about a minute then push through a tamis and into a cylinder mold to give it the torchon look. I could serve a 4oz portion for 10$! Then the cafe ended up closing..
the french laundry does something similar, basically makes a torchon, tamis it and pipes it into terrine molds. works great. Jeff McCarthy : Tentop presents “Supfast” - Part 1.